Remember Mark’s friend Gene from high school, the one I went to Japan and Hong Kong with a few years ago? Well, it turns out he got married… and forgot to tell anyone about it for five months. (A situation, I might add, that I predicted while on that trip, but I totally meant it as a joke, not a suggestion.) Anyway, Gene and his wife did decide to have a second “for show” wedding last month, only ten months after the first one, and we went up to Michigan for it. And we went in style. I can only imagine Gene forgot who he was friends with for a minute there. I was putting together this braiding picture tutorial for another site, but I decided to post it here, too, since Molly asked me a question about ideas for doing her hair recently. I decided to call the first one of these the “Training Braid” for two reasons. 1) It’s how I taught myself to braid my hair behind my back. 2) It how I frequently wear my hair when at karate. It holds up well to lots of movement, and even if you can’t take the time to redo your hair after exercising, it still looks good. My competing choice for the name was the “Cheater French Braid” because it mimics the look of a French braid without taking nearly that long. For the record, here is my hair to start with, combed and detangled. Then I draw back the hair from approximately ear to ear and pull it up to the top center. I end up with about 1/3 of my hair in this small ponytail. Having 1/3 of the hair up instead of closer to 1/2 is important, because the next step is to divide the rest of the hair in half, one to each side. The hardest part of learning how to braid my hair behind my back was figuring out how to divide it into thirds and hold it all. Having the center third held in a ponytail already was a bit like giving myself an extra hand. Then, braid! I always end up starting with the right side over the center first, then left, and so on, but it doesn’t matter. Once I braid so far down behind my head that I can’t reach any further, I draw it all over my left shoulder and continue to the end. 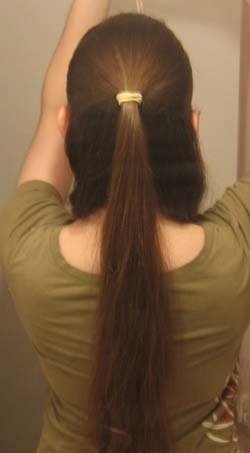 I recently came up with a variation of this, which mimics the look of dual French braids in the front. This is a good thing, because while I have finally figured out how to do double French braids now, the last time I did it, I almost lost all the feeling in my arms before I was done. It took me about half an hour. I generally don’t repeat hair styles that take more than 5 minutes, 10 at the most.